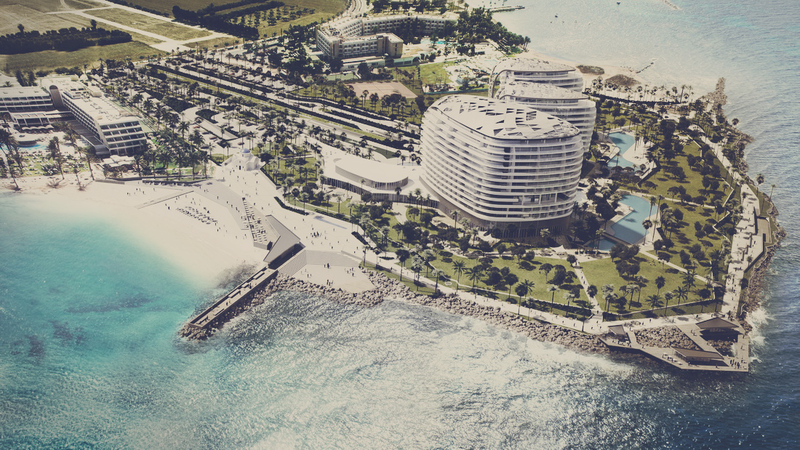 The town planning department has approved building permit to construct two 12-storey high-rise buildings and 122 apartments at Geroskipou in Paphos as part of the Peninsula Resort project. A proposed €3.4 billion resort development project in Geroskipou, Paphos has been given the go ahead with building permits issued to construct two 12-storey high-rises with a total of 122 apartments. The residential development, called Peninsula resort, is part of the larger 200-hectare Eden City Cyprus project, a joint venture of the Archbishop of Cyprus and ATUM Developments Ltd, headed by Hungarian tycoon Sandor Kenyeres. The Peninsula Resort phase was given the green light by the Town Planning Department after the Department of Antiquities submitted a positive report regarding the planned construction in the area belonging to the Church of Cyprus. The Antiquities Department and the consortium are in complete agreement regarding the protection of archaeological remnants located within the site in question. It is also expected that the Department of Antiquities will continue its excavations in the western part of the site, where the company plans to build a luxury hotel but has not taken any action pending the completion of the building permits procedure. The Peninsula Resort, according to the environmental study filed with the Environment Department, is to include a 14-storey five-star hotel (the largest tower) with 220 rooms and two 12-storey high-rises with a total of 122 apartments, at an estimated cost of more than €100 mln. Eden City consists of three parts: the Peninsula Resort, the first phase, which will be constructed on church-owned land, the Garden of Eden (a business area) also to be built on state-owned land and Divina Island, a man-made island development to be created off the peninsula. The artificial ‘luxury lifestyle’ island, will cover 137 hectares, and is to include beachfront villas and a marina with a capacity of 500 boats. The construction of Eden City has been beset by delays as the government and the consortium have yet to come to an agreement over the annual rent to be paid for the use of state land. Meanwhile, the list of developers exhibiting an interest in building luxury high-rise accommodation on the southwest coast of the island is growing bigger. In Limassol, already well-established players are leading the high-rise construction sector.